Hello, fellow gadgetophiles, and welcome back to my volcanic lair for the annual Gagdetbox late-spring-almost-summer barbecue. I’ve been straightening up a bit in expectation of your imminent arrival, so try not to make a mess—it makes the robots angry (you wouldn’t like them when they’re angry). There’s chips and dip on the Surface, and one cold Dr. Pepper in the mini USB fridge. No fighting over it. Once you’re settled, we’ll fire up the grill and check out this week’s exciting new installment of Gadgetbox. There’s a purported iPhone killer, gadgets that nix batteries and power adapters, and a way to get rid of some of that pesky exercise, all through the wonders of technology. 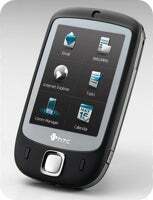 In what is sure to be merely one in a long line of attempts to assassinate the iPhone, HTC has launched the HTC Touch. Though the device runs Windows Mobile 6, it adds on top of it a system called TouchFLO, designed by HTC (and probably a little help from their friends in Redmond). What does TouchFLO do? Well, it lets you use your finger to navigate your phone. Genius . Where do they come up with this stuff? TouchFLO can apparently tell whether you’re using your finger or a stylus, and lets you flick through photos, web pages, contacts, emails, with a natural “sweeping” motion. All very familiar. One thing, however, that the Touch does not apparently let you do is use multiple fingers—Apple appears to have that one locked up. They do claim to have a “3D interface” but a look at the demo on HTC’s site shows that it’s mainly a fairly tame transition effect. The Touch has a smaller screen than the iPhone, at only 2.8”, and it’s just tri-band GSM with EDGE. There’s also 802.11 b/g Wi-Fi, Bluetooth 2.0, and a 2.0 megapixel camera, though the Touch lacks internal storage, coming instead with a 1GB microSD card. On sale now in the UK, it’ll be heading to North America later in the year. Having even watched a few videos of the interface, I confess find myself untouched by desire. It’s lacking something, and that something is style . You just don’t got it, HTC—sorry. No hard feelings. Usually I shy away from talking about concept devices in favor of things that you can run out and buy right now , but I was just so impressed with what I’d seen of Sony’s “Odo” concepts (named, no doubt, after DS9’s cantankerous constable ). The idea behind Odo is to create environmentally-friendly high-tech devices. The Spin ‘N Snap camera, for example, offers two holes which serve both as viewfinders and the means for powering the camera. Pulling the two ends of the camera outwards reveals the lens in the center; to charge up the camera, you insert a finger in each hole and spin it around—an internal dynamo uses the spinning motion to charge the camera for the next shot. The Push POWER Play is a viewer device (for images or video, I’m not sure) that charges when you roll it across the table. There’s also a Juice Box device which seems to conceal some sort of foldable solar array for charging up energy via the sun (which can then be used to power the Push POWER Play or other devices). All the devices were made from recycled plastics. There were a couple of other nifty gadgets, but Google’s translation from the Japanese is imprecise , so I’m not sure exactly what they do. It’s nice to see a high-tech company seriously thinking about alternative sources of energy—if you think about the amount of power consumed by charging our myriad personal devices, or the number of batteries we go through, then it’s clear that renewable sources of energy are the way to go in the future. You simply cannot have too many remotes. As the owner of at least half a dozen regularly used remote controls , I say this to you. And when you have that many cluttering your coffee table, end table, cat, and sofa, what’s one more to add to the mix? Especially when it’s a remote that’s as useful as the Remote Control Outlet. Ever wanted to turn that light off but it’s just too far across the room? The Remote Control Outlet is for you, my friend. Want to flip off that fan without walking all the way over to it ? Look no further. Feel compelled to play pranks on your friends and roommates by spontaneously switching off their computers, printers, televisions, and other sundry devices, just when they’re at a critical moment? Boy, oh boy, do you ever need a Remote Control Outlet. 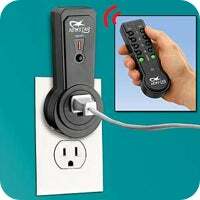 The remote itself is powered by a pair of AAA batteries, and can control up to four outlets from anywhere in your McMansion, up to 100 feet away. A pack with the remote and one outlet costs $20; additional outlets cost $10. Hardly too high a price to pay for all the wear-and-tear you’re saving on your knees. Looks like it’s time to stock up the mini fridge again. That’s all for this week. Darn it, I told you guys not to make a mess. Now I have to summon the Roomba army to clean up, and they’re not going to be happy.